White English colonist and Natives were opnely violent to eachother for much of the early seventeenth century. 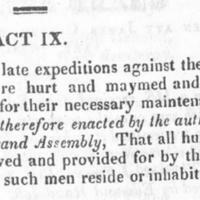 A few months prior to the passing of this act, the Third Anglo-Powhatan War started, resulting in many deaths and injuries on both sides. This act looks to address the problem of what should be done for those who were injured and incapacitated from battle to adequately provide for themselves. Citation: Statutes at large of Virginia (1619-1808), Compiled by William Waller Hening, 1809, call number KFV2425.2 1619, Manusrcipts & Special Collections, The Library of Virginia, Richmond. Analyze: What can this act tell us about race relations at the time? Current Connections: Who is responsible for the care of injured veterans now? Has this changed from the 17th century? In Their Shoes: If you were an able bodied colonist during this time, why or why wouldn't you support this act? 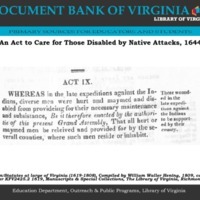 “An Act to Care for Those Disabled by Native Attacks, 1644,” Document Bank of Virginia, accessed April 21, 2019, http://edu.lva.virginia.gov/dbva/items/show/117.